2.4kW Heat Output. Wick Double Burner Highly Efficient.CE & NF Approved. NF APPROVED: Made to the highest French safety standards with genuine Swedish made CO2 sensor. NO INSTALLATION. 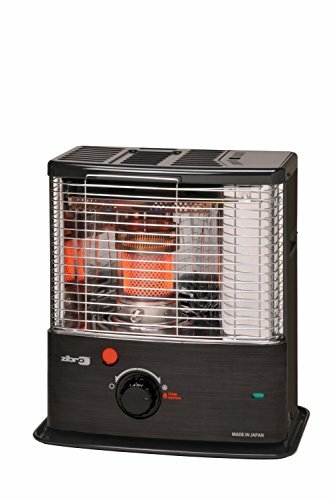 This wick heater can be installed without wires and without exhaust pipes. This makes it a very convenient heating source. Suitable for room volumes up to 85m3 HIGH EFFICIENCY: The Zibro heater by Toyotomi has 99.99% heat efficiency with Infrared-ray heating. REMOVABLE FUEL TANK: The heater is provided with a removable fuel tank with a capacity of 4.0 liters, which will ensure a burning time of max. 16.0 hours. FUEL FILTER: Preventing impurities, the paraffin will be filtered, increasing the life cycle of the felt wick and removable fuel tank. AUTOMATIC IGNITION: The heater is easy to operate, simply by turning the main dial to the right and push the igniter button, activating the "spark" or pizazz element. TRIPLE SAFETY EXTINGUISHER There are 3 extinguishing methods on the RS - 240 1. By retracting the wick. 2. By pushing emergency / safety button. 3. Automatic shut-off is activated when the heater is bumped into, or in the event of a tip-over (earthquake safety device). SAFETY DEVICE: The heater is equipped with a tip over switch and overheat protector, which will shut off the heater when the temperature in the room will exceed 32° C. DESIGN: this heater is part of the latest design "Kero Sun" made by Toyotomi heating range, which you can recognize by its stylish design grille and new dual colour print (new stainless steel / noir) MADE IN JAPAN: Manufactured according to ISO 9000 :2000 standards in Japan, with a 4 year guarantee. NF APPROVED - True CO2 sensor that protect the family against the possibility of the build up of CO2 in the environment the product is used in.